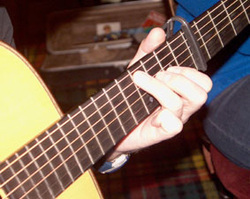 Penicuik Folk Club Singers' Nights are relaxed, informal and easy-going evenings of music-making and listening, where musicians of any age and level of ability are welcome. You will hear all standards at a Singers' night! We are pleased to welcome children (despite the licensed premises - we meet in a function room) and even an occasional poet. All reasonable interpretations of the term "folk music" are enjoyed. Most of our regular attenders are straight-down-the-line folkies (traditional and otherwise - we count blues as "folk" and have no prejudices about written songs!) but we welcome country, acoustic jazz, durable pop/rock songs and anything that is vaguely roots-based or is likely to enter the tradition. Our tastes are eclectic and, althought he majority of our regulars are singers, we love to hear pipes, fiddles, cellos' harps, digeridoos - if you can make folkie noises on it, bring it on down! There are no real "rules" at our singers' nights, although we tend to simply take it in turns to sing/play, or to lead the singing/playing. We like to ask visitors to take extra "turns" as we can hear ourselves every week!